Fabulous Fyst Double Review Disclaimer! - I watched the Blu-Ray version of this season, and the TV version of the second. Also, I wrote the first review before watching the second season. I just didn't post it, because school things, ok? ok. Here we go. 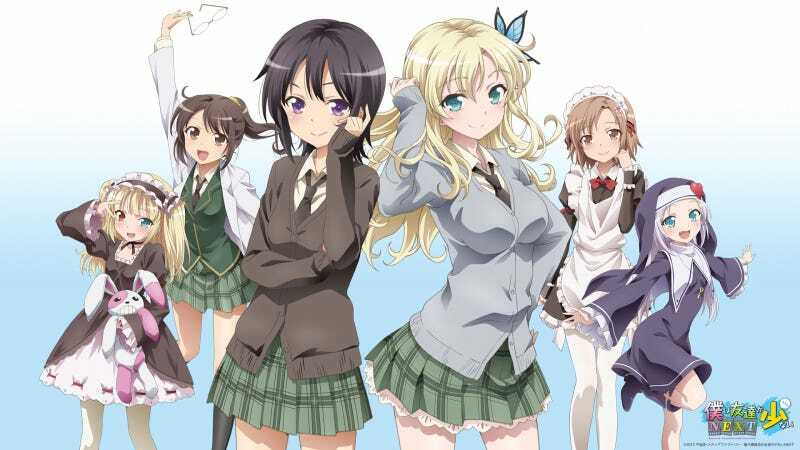 The Introduction - Boku wa Tomodachi ga Sukunai is a show about a boy Kodaka who has naturally blond hair, and a mean looking face transferring to a new school. His appearance and inability to socialize because of it keeps him from making a single friend. One day he overhears a girl talking to herself, and finds himself stumbling into the Neighbors club a club with the sole goal of making new friends! The Neighbors Club becomes a fun collection of misfits whose activities make up this show. The Fabulous - The humor and character interaction elevate this show from just a regular harem styled anime to another level. It levies the social inadequacies that the members of this club have for some great laughs, but importantly it doesn't ever make you feel like you're laughing at these people which is great. The relationship between Yozora and Sena in particular is great and rich with material that the show exploits. The other thing that this show does well is it's side characters, especially Sena's father who's used for quite a few good laughs. Nice variation of tropes and some light deconstruction of the genre, makes for a pretty good watch. The Meh - The fan service in the version I watched was pretty out of control in a few episodes. It was only a couple of episodes, but when it showed up boy was I surprised! Maria the club's advisor is given almost nothing to do throughout this season other than eat and say "poop" or "poopy vampire" or something else poop related. which had it's moments, but meh. The Unfabulous - Kodaka is dense. Like seriously dense. It's almost as if it's intentional. Oh and sometimes I have a disconnect with the characters, I find myself thinking "you don't need to be popular or have friends to do this, you guys are just being stupid." The ending didn't feel satisfying at all. They must have known they were going to be getting a second season, but if I were watching this live I would have been so pissed. The Introduction - Boku wa Tomodachi ga Sukunai Next continues the adventures of The Neighbors Club. More craziness comes to light and we learn some revealing backstory for some of the cast. This season dips it's toes into a little more serious tone, but only slightly. The change is nice for some of the subtext that was placed into the first season. The big highlight of the season is that the club is making a movie for their cultural festival. The Fabulous - The humor and character interaction are still the highlights of the show, but this time it's not Yozora and Sena that steal the show, it's Rika. She is now one of my favorite characters in a rom-com ever. It was good to see a character behave like a real person would (Rika, act normal, what are you talking about?) Rika puts on a mask, and behaves differently around everyone else, except for when she's alone with Kodaka in order to protect herself. And she's brutally honest with him, which because he's dense is a good thing. Too bad she's not one of the main two heroines, I think she should be the one he ends up with. Some of the other characters do well in this season as well. Sena and Yukimura (Who I don't think I mentioned at all in the previous review, but I don't want to spoil anything) get great parts. The Meh - Maria is still one dimensional, while one of the main two heroines feels under used this season, Yozora felt stagnant for as big of a role as she had in season one. Some of the episodes felt rehashed from the previous season with tweaks to what was going on. Where I could see them saying the differences highlight the differences in the characters as they grow, it felt recycled more than once. The Unfabulous - Again the ending didn't feel satisfying at all. This is becoming a trend with this show, but I must say it's better than the first one, but it clearly isn't the end this series deserves. I wonder if a third season is coming? The Conclusion - This was a somewhat more serious season and some of the revelations in the final few episodes seriously surprised me. (Rika, looking at you) I think I enjoyed the humor more in season one and the characters more in season two. I give this season 4/5 trains as well.